"I even hear them say that prices are skyrocketing," said Jeremy Cunningham, a northern Virginia real estate agent with Redfin, a real estate brokerage. "When you ask them what their data source is or where they're getting their information, it's more of a vibe." 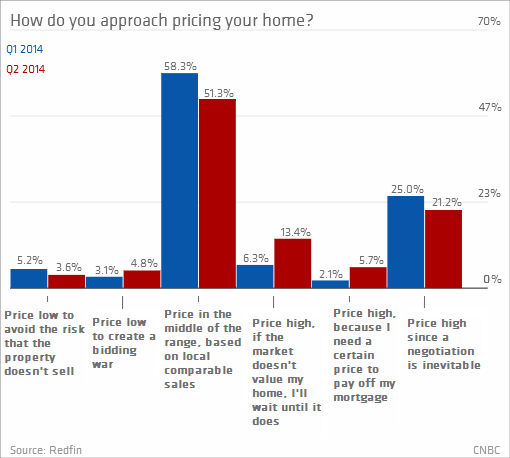 Forty percent of sellers surveyed by Redfin said they are planning on pricing their homes above market value when they list in the second quarter of this year; that's up from 33 percent at the beginning of the year. Redfin polled 1,128 active home sellers across 25 U.S. cities. Read More Why millennials rent: What do you think? "Consistent with (April's) upbeat jobs report, concern about job loss among employed consumers also has hit a record survey low. These results are in line with our expectations for increased housing activity and gradual strengthening of the housing market going into the spring and summer selling season," said Doug Duncan, Fannie Mae's chief economist. More sellers now say they are pricing their homes high because they are willing to wait if it doesn't sell, according to Redfin. An increasing number of sellers also say they are pricing high because they need that value to pay off their mortgages. Nearly 10 million U.S. homeowners were underwater on their mortgages at the end of last year, according to Zillow. "My wife and myself, we take a lot of pride in our house and did a lot of upgrades," said Brad Soricelli. "We put a lot of money into it, so in trying to reconcile that with what the market is now, there was a little back and forth." "When you look at comps, it's very difficult. The trends are hard to identify," said Cunningham. "You could have on any given street, price variations of $50,000 to $75,000 for the exact same house." The Soricellis did take Cunningham's advice and brought their asking price down. The house sold in one day, but they say they have no regrets. "Not having to go through waiting and some of the aggravation of having your house on the market for a period of time is worth a certain amount of money," said Brad Soricelli. Especially when they look across the street. Their neighbor's house, which has already undergone a price drop, is still sitting on the market.